Anthony John Group have unveiled retail precinct plans for its $600m mixed-use Southpoint development, set to be delivered in line with completion of Flight Centre’s global headquarters in mid-2016. 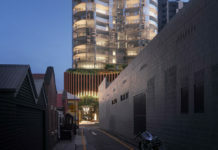 A total of 4,500sqm will be offered over two levels and include a mixture of fresh food, dining and boutique retail options, catering to South Bank’s rapidly increasing worker, resident, visitor and commuter segments. Anchor tenant Woolworths has already been secured with a 1200sqm 20 year lease, giving South Bank its first major supermarket. 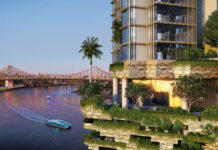 Anthony John Group CEO Shane Bulloch said Southpoint is set to further enhance South Bank’s premium destination appeal, whilst working to complement the existing mix. Mr Bulloch said the planned retail is aligned to South Bank Corporation’s vision for the site, creating a village- style market atmosphere that services the needs of immediate traffic generated by commuters, workers, students and residents. Helping create a striking entry statement will be the heritage listed Collins Place, which will be restored and refurbished and used again as it was during World Expo 88 as a destination restaurant. South Bank train station, with approximately 60,000 commuters boarding and alighting each week, is also set to receive a $5m facelift, inclusive of new railway entry, travellators, ticket office, toilets, platform upgrades and platform awnings. Southpoint’s retail will be delivered in mid-2016.